Just as Facebook advertising and Amazon recommendations prove that algorithms can be applied usefully but are no substitute for human input. 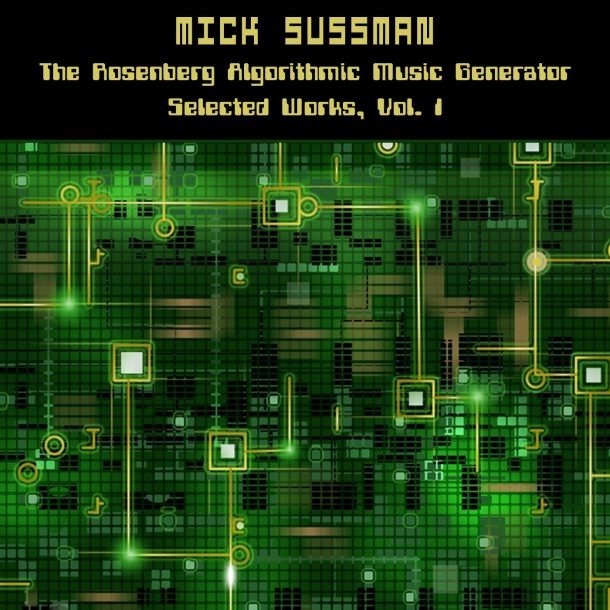 Of course, The Rosenberg Algorithmic Music Generator is subject to human input, in that it was created by Mick Sussman himself. A programme is designed to ‘compose’ ‘unique’ music, by ‘making decisions based on a sequence of randomised processes.’ The nineteen compositions collected here seem to suggest a greater leaning toward the random than the musical. There are notes and there are rhythms, but none of them seem to coordinate with one another, and the sounds are trebly synthetic, 80s computer gamey. The cover art has obvious ‘matrix’ connotations, and tells much of the story of what The Rosenberg Algorithmic Music Generator is about. Only, this is the sound of the matrix collapsing, of being stretched and pulled in all directions, twisted and tossed. Sussman observes in the liner notes that in programming terms, Rosenberg is a primitive piece of coding, but is sufficiently versatile to enable him to vary musical phrasings and tempos – to the extent that one option enables the user to allocate a different tempo to each instrument. Why would anyone do this? Because, I suppose. It’s an indication of Sussman’s adoption of avant-garde principles, to disassemble and reconfigure that which has gone before, to build anew. It may well be that no-one has done this before not because they haven’t thought of it, but because they didn’t want to, but that’s every reason for Sussman to be the first. The result is a disorientating, bleepy, bloopy clamour of sound, with digital notes flying in all directions in an exercise where the concept is considerably more appealing than the experience of the end product.